A three-part lesson series on drawing a heavily wooded landscape with charcoal. Both vine and compressed charcoal are used to gradually develop the texture of the leaves and the balance of light and dark within the scene. Blending stumps are used to ease transitions and develop the edges of the leaves. The finished drawing features a defined focal point where the road disappears into intense light surrounded by the darkness of the forest. I acquired a lot of my art supplies when a local art teacher retired. I have a selection of charcoal material but am unsure of what I have. The vine charcoal is easy to identify and so are the charcoal pencils but I have multiple pieces of charcoal that are difficult to determine what they are. One box contains 3 black square charcoal pieces and one white that is the same shape but there is nothing to tell any more. I seem to get a fine dark line. There is one box which contains 15 pieces of a medium soft about the diameter and size of a pencil. Then I have a mishmash box that seems to contain the broken pieces of several varieties of charcoal. I know I am probably asking the impossible but is there any way to determine what I have. 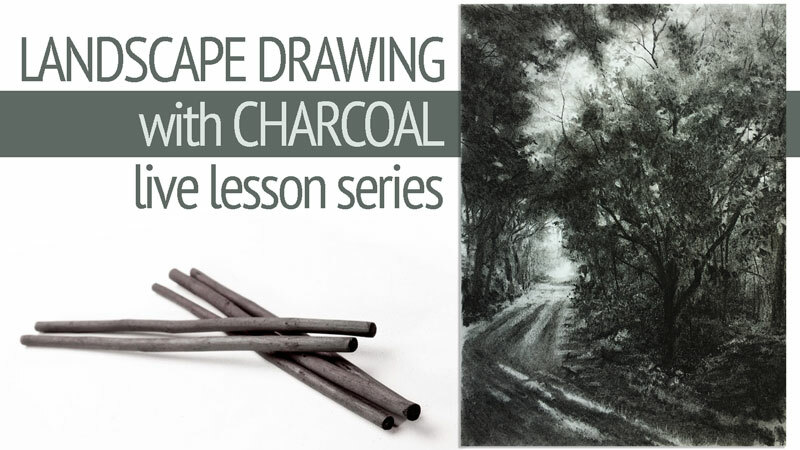 I am intrigued with this latest live lesson on charcoal and would like to give it a try. i followed along with you.my vine is not staying on the pastel paper….do you suppose it is just old? oh….i vote # 1…so glad it won…. wow the drawing is much more beautiful than the reference picture! Love it ! We couldn’t see the reference photo. Did no one say anything? Love the live lesson Matt. I’ve only just joined and this is the first ‘live’ lesson I’ve taken part in. Really enjoyed drawing whilst following you. I’m guessing you’re on Eastern Standard Time and as I’m in five hours ahead of you (I’m in England) I doubt I’ll be able to be live on the lesson, but I can always catch up even if I can’t join in on the chat box. Any chance I could download the reference picture so I can have it in front of me whilst drawing? It’s hard to see on the screen. Hi Matt. Actually,I do possess tinted charcoal. Lovely to work with.